A remarkable 125/1 win for a horse called Feel Glorious caused a stir on the second day of the 2018 Qatar Goodwood Festival. On Sussex Stakes day, the feature race took the headlines - report here - but there was plenty more to thrill a good-sized crowd on another warm and sunny afternoon - not least the huge-priced winner late in the card. Feel Glorious, unplaced in two previous races, pulled off the 125/1 shock when landing the 17-runner Victoria Racing Club Fillies' Maiden for Surrey trainer George Baker, who was celebrating his 53rd birthday. 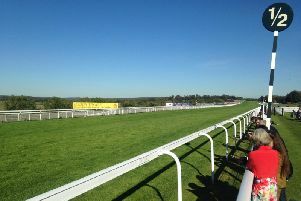 The venue for the win, high on the Sussex Downs, could not have been more appropriate, as the name Feel Glorious implies. And Goodwood staff had even helped Baker name the horse. A daughter of stallion Bated Breath, she was given her name following a collaboration between the Bakers - George and his wife Candida - and Goodwood Racecourse, which last year ran a social media fashion marketing campaign titled #feelglorious. Goodwood has been following the filly since via social media, and will be taking an even closer interest in her after this memorable triumph. To a rendition of 'Happy Birthday', sung by racegoers around the winner's enclosure and members of the Turf Club syndicate which owns the filly, Baker stepped forward to receive the winning trainer's prize, having admitted he ran Feel Glorious more in hope than expectation. Ridden by Pat Cosgrave, she won by a neck and half a length from Alhakmah (4/1f) and Welcoming (5/1). Initially Baker joked: "I really fancied her, and thought she was a bit of a certainty today," before admitting: "No, she's a lovely filly and she disappointed me at Kempton last time out when drawn wide and did a lot of running early and just ran out of puff. Today I felt that if she finished mid-division in a hot maiden like this I would be delighted, but I didn't just bring her here for the good of her health. It's only down the road for us [he trains near Chiddingfold] and we've always liked her, but she's just been bubbling under." Earlier owner Andy Smith was jubilant with the victory of Lil Rockerfeller in the long-distance £50,000 Matchbook Betting Podcast Goodwood Handicap. Smith, a professional punter by trade, recognised the race conditions - a handicap over more than two and a half miles - were ideal for the horse in which he is a joint-owner, and who is best known as a top-class staying hurdler. Rated 153 over hurdles, he is rated just 82 on the Flat. Lil Rockerfeller was not quite ready for last year's race, but here, under Silvestre De Sousa, he made the running and ground his rivals into a long submission, scoring as the 11/4 favourite by 15 lengths and half a length from Altaayil (28/1) and Imphal (7/1). Wiltshire-based Neil King, who is best known as a trainer of jumpers, had not saddled any Goodwood winner before today. He said: "That's terrific - fantastic. I'm so thrilled with him and delighted for one of his owners, Andy Smith. He's had his heart set on winning this for the past year, but I was worried about the ground at this time of year, and he's missed two engagements because of quick ground already this season. He's been on the go a long time since finishing second at Sandown [over hurdles in late April], and I'm delighted we have pulled it off." West Sussex trainer William Knight landed his first winner of the 2018 Qatar Goodwood Festival with the victory of 20/1 shot Soto Sizzler in the 12-furlong Move Over To Matchbook Handicap. Ridden by Jimmy Quinn, the three-year-old son of Mastercraftsman made strong headway towards the outside of the field to challenge for the lead well inside the final furlong. Soto Sizzler responded willingly to Quinn's urgings to edge ahead close home to score by a length from 5/2 favourite Corgi, trained by Hughie Morrison and ridden by Jim Crowley, in second. Knight, who trains at Lower Coombe Stables at Angmering Park, sent out the 2010 Qatar Goodwood Cup winner Illustrious Blue and he was delighted to register his fifth winner at the Qatar Goodwood Festival. He said: "I'm delighted with Soto Sizzler. I loved this horse all along and he is only going to get better with time. This is his first win. I think he will get further next year. For the time being, we will probably stick at 12 furlongs, but I think he could get two miles next year." Richard Spencer's fledgling training career took another big step forward when Rumble Inthejungle won the £75,000 G3 Markel Insurance Molecomb Stakes over five furlongs. Last year Spencer trained the winner of a top two-year-old race at Royal Ascot, when Rajasinghe landed the G2 Coventry Stakes, but a win at the Qatar Goodwood Festival confirmed he is no one-hit wonder. With the backing of Phil Cunningham, the head of Rebel Racing which owns the yard at which Spencer is based in Newmarket, the young trainer's career is on an upward curve. Rumble Inthejungle is a son of Bungleinthejungle, who won the Markel Insurance Molecomb Stakes in 2012. Ridden by Tom Queally, the son and heir was sent off at 5/1 and scored by two and a half lengths and a neck from Life Of Riley (16/1) and Royal Ascot winner Soldier's Call (6/4f). Spencer said of the winner, who was fourth in the G2 Norfolk Stakes at Royal Ascot on his previous start: "I felt if I could have got another run into him before Ascot he would have won there, but he went a bit weak on us when we wanted to do crucial bits of work. He's only a baby still and he's grown a lot since Ascot." The Mick Channon-trained Caravela (11/1) captured the EBF Breeders' Series Fillies' Handicap under Andrea Atzeni, the sixth race on day two. The four-year-old daughter of Henrythenavigator launched a powerful challenge towards the outside of the field in the home straight and responded willingly to Atzeni's urgings to score by a length and three-quarters from Roger Charlton's Savaanah (4/1), who filled the runner-up position in the 10-furlong contest. Channon, registering his first victory at this year's Qatar Goodwood Festival, commented: "Caravela won nicely today. We thought she had a chance and we are delighted she has won. She is quite a valuable filly who is by Henrythenavigator and we think there is a bit more to come from her. "She hasn't been the easiest horse to train and has had lots of niggles throughout her career. We've had to wait for her, but if they're good you don't mind waiting!" Then the crowd were treated to a jewel in the crown of Arabian horse racing. The (Arabian G1) Qatar International Stakes, run over a mile and worth £400,000 in total prize money, was won in runaway style by six-year-old Muraaqib, carrying jockey Jim Crowley in the familiar colours of Sheikh Hamdan. Trained in France by Francois Rohaut, the winner scored by one and a half lengths and two lengths from Ebraz (9/4f), who was following up his second place in the same race last year, and Lightning Bolt (5/1). There is a £1m bonus for any horse who wins the Arabian Triple Crown, comprising today's race plus legs at Longchamp on Prix de l'Arc de Triomphe Sunday in October, and at Doha in Qatar in February, but Rohaut does not expect Muraaqib to take in the French race, which is over 2,000 metres (about 10 furlongs). Rohaut said: "He has been in my yard for four years now and in my eyes has always been a champion. He is the best Arabian horse I have trained and probably right now he is the best in the world, certainly at a mile. He was wearing blinkers for the first time today and it made a big difference - he was beaten last time out, but we wanted to keep them for today's race. I don't think he'll go to Longchamp because he is so good over a mile, unless Sheikh Hamdan wants him to run there. He will go to Abu Dhabi [for a G1 race] in November." Top-weight Medahim provided owners Al Shaqab Racing, trainer Richard Hannon and jockey Ryan Moore with a second winner of the Qatar Goodwood Festival following the 7/1 shot's narrow success in the concluding race on day two of the Qatar Goodwood Festival, the seven-furlong Goodwood Racehorse Owners Group Handicap. The same owner, trainer and jockey combination teamed up to land yesterday's Nginious! Swiss Gin EBF Maiden with Watan. The four-year-old son of Kodiac came with a tremendous late run to collar Mark Johnston's Vale Of Kent, the 5/1 joint-favourite in the shadows of the post, scoring by a neck in a time of 1m 27.00s. Hannon said: "Medahim has been unlucky in a few races, but he always tries very hard and it's great that he has come here today and won a race. He deserved that as he has had a few hard misses. He was well drawn today and if you are well drawn here that always helps. There's plenty of opportunities for him going forward. He is not the most straightforward but he has coped with his racing very well. There might be a nice handicap for him at York but we'll take him home first."